Card Text Action: Discard the top card of each player’s deck. 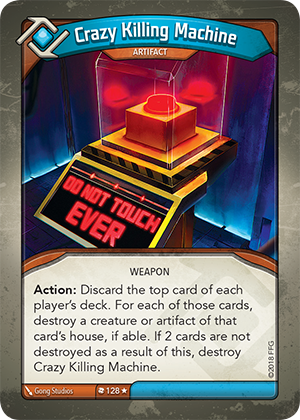 For each of those cards, destroy a creature or artifact of that card’s house, if able. If 2 cards are not destroyed as a result of this, destroy Crazy Killing Machine. What happens if I use Crazy Killing Machine’s “Action:” ability and a player’s deck is empty? You can only shuffle your discard pile to reset your deck when you need to draw a card, not when you discard a card. Therefore, if a deck is empty, that player cannot discard a card and, as a result, no creature or artifact will be destroyed. If the other player’s deck is not empty, they will discard a card and destroy a card as normal. What happens if use Crazy Killing Machine’s “Action:” ability and both discarded cards are from the same house? Each player must destroy 2 cards of that house, if able.